Start your Year strong. February Infographic. More subscribers = more business. Increase the impact of your marketing with more contacts. February is a time to spread the love, and we aren’t just talking about Valentine’s Day. Check out some of our suggestions below to help build relationships with your customers and make someone else’s day. Let us help you start building your list with these great tools. Growing your email list is essential to growing your business. The more people you reach, the more impactful your marketing will be. It’s why Constant Contact has several list-growth tools to help you add more contacts to your list. These tools will automatically add names into your account—no typing required. These easy-to-install forms let people join directly from your website. Let them join right from your social media page. 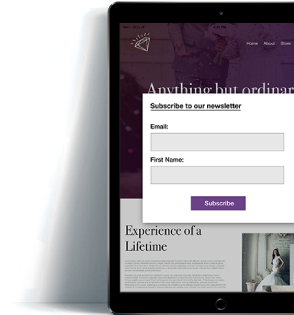 Collect new subscribers directly from your tablet. Make signing up for your list as easy as sending a text. Need help putting these list builder and other tools to use? We can provide you with a wide range of marketing services. Get in touch to find out how we can better your marketing and grow your business.